C'mon folks, let's give it up for Ted Cruz! Dear Patriots. 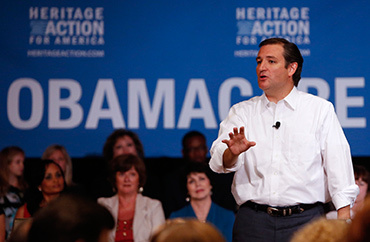 Sen Ted Cruz went to bat for us, putting it all on the line, to defund Obamacare. With 5 million thus far and the number expected to grow to 129 million Americans losing their health care plan, Cruz's effort was a remarkable display of courageous leadership. As you eat turkey (Mary and I have discovered tur-duc-ken) with your families over the holidays, please help us place our "Thank You Ted Cruz" ad on TV across America. Here are our media buys thus far; NFL Football, including the pre-game and post-game shows and on all 3 networks that will broadcast Thanksgiving Football (CBS, FOX, NBC). But we need more. Happy Thanksgiving and May God Bless Us, Every One!